We love Halloween in our house – For the children it’s a wonderful time for getting dressed up and being silly and as adults (equally a time for getting dressed up and being silly). We’ve played host to some great Halloween parties in the past and of course looking forward to UNICEF party this weekend. This year I wanted to play around with some other ideas and step away from the usual colour palette of orange or red and black and white. Though I have used orange, red and black in the tablescapes I have created – I have teamed them with colours and themes less conventional. In Mexico they celebrate the dead on “day of the dead”… celebrating those who have passed and helping them on their spiritual journey. 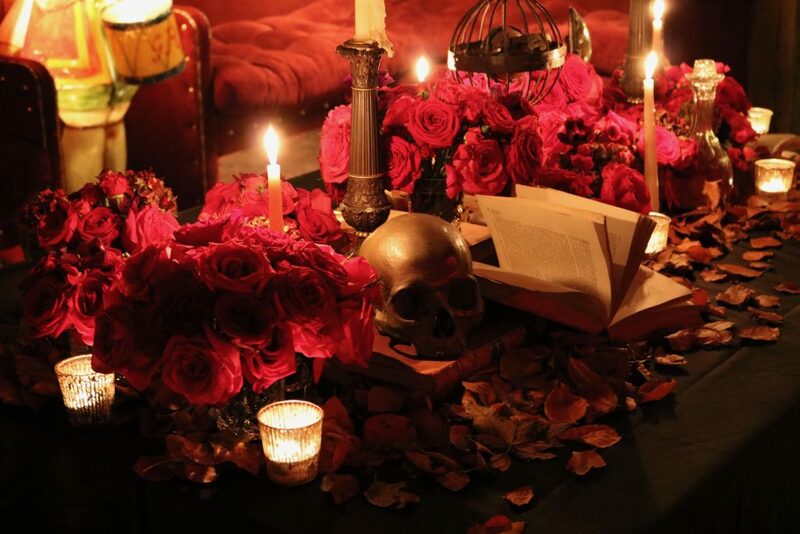 Between the 31st and 2nd of November they adorn their houses with flowers and decorations and create shrines. 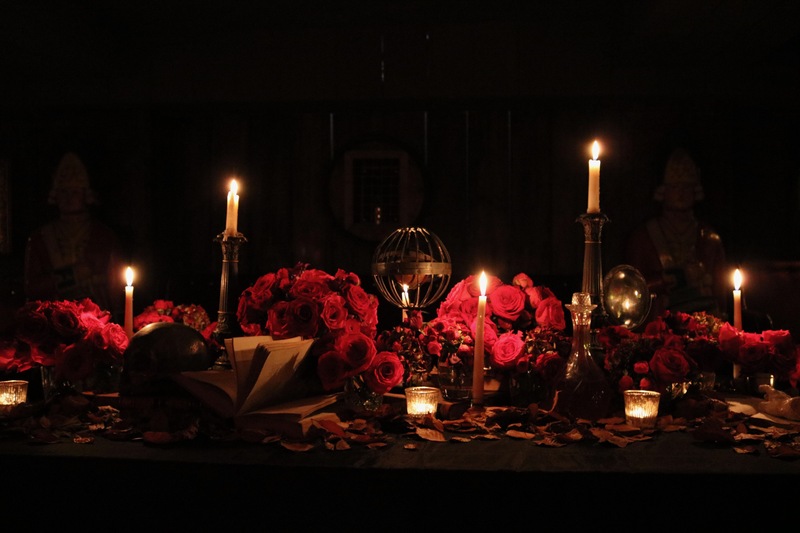 I love this concept – it’s full of light and happiness and I really wanted to create a Halloween tablescape inspired by this special celebration. I used a patch work of vintage linens as the tablecloth – we are hoarders so had these but a local charity shop or antiques market will be sure to sell. 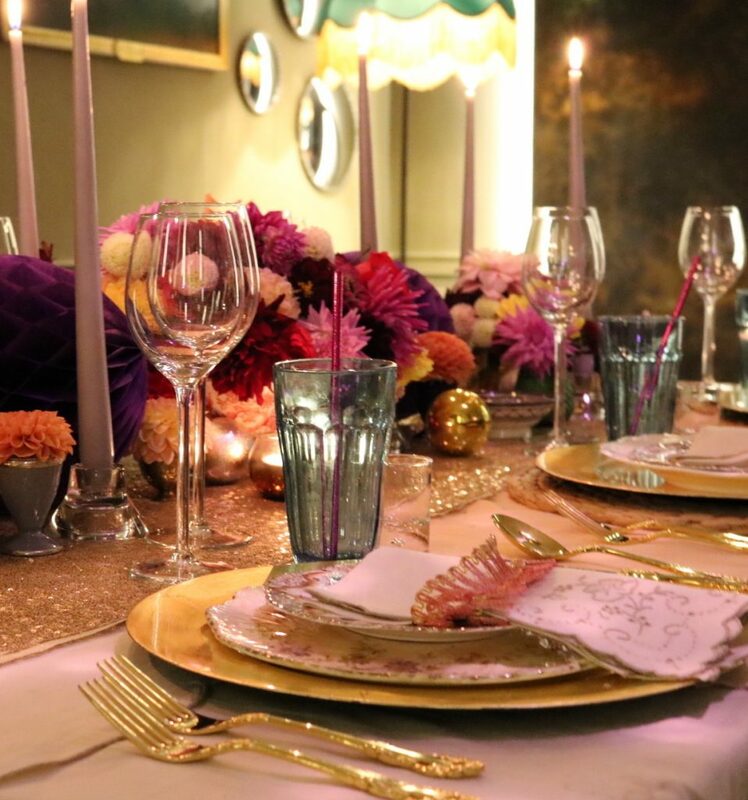 With this theme I think you mix rustic – with shiny… I used woven table mats but then used gold glass chargers – the plates were a vintage set of mix match I’ve been collecting for years… and the water glasses from a high street home store. Vintage gold cutlery set it all off. Napkins again vintage were tied in a unusual ribbon I found at the haberdashery – felt almost like it had come straight from a street festival in Mexico. 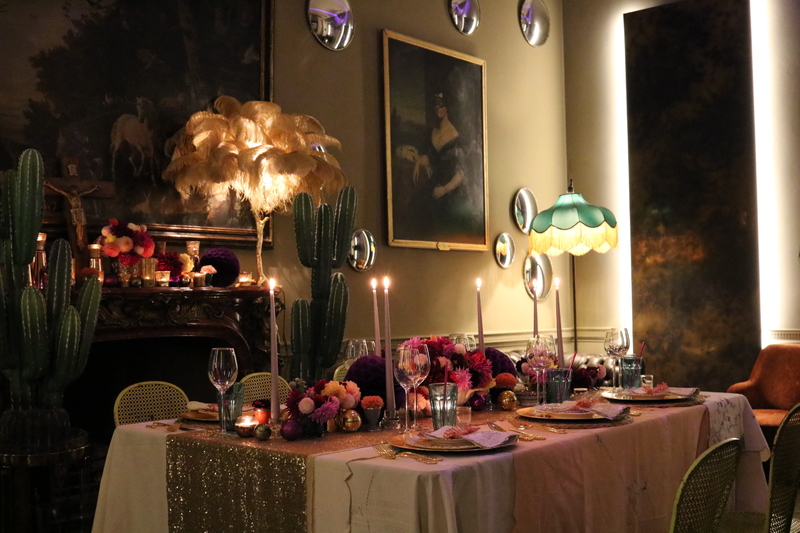 Dim the lights and create a dark glamourous feel to this dinner party! 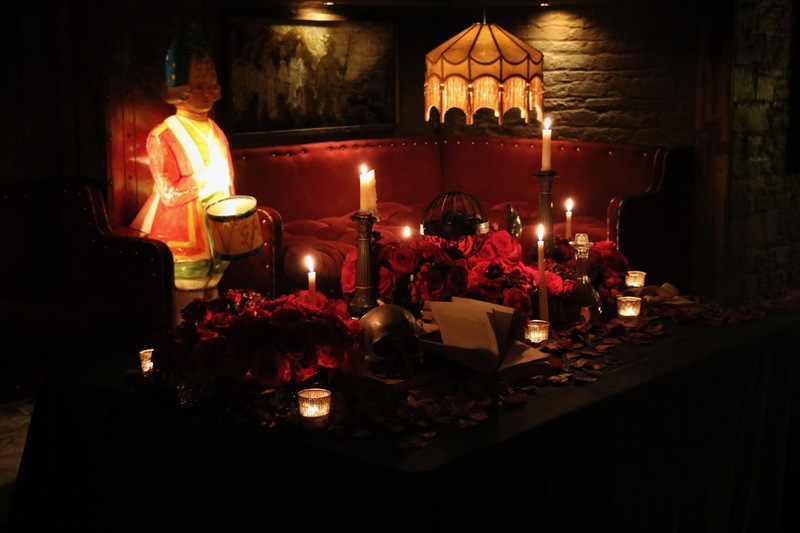 A black table cloth and the deep red roses add instant glamour to this look. The roses are not all blood red as I added a fuchsia pink to added deeper tones. 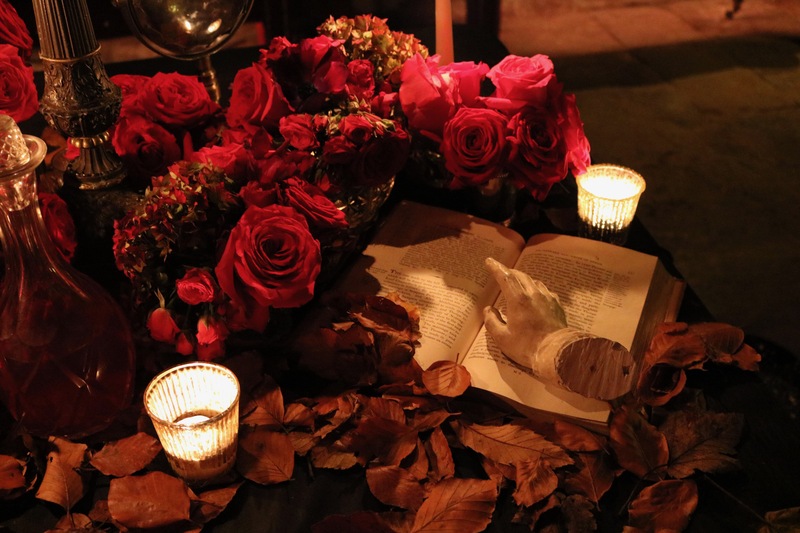 With any table decoration you should create heights – this is achieved with smaller and taller vases and candles or as we did on this table “spell” books by stacking them and opening. Lyon helped me to put the table look together – he has definitely inherited our love for styling and creating – it was under his instruction we opened the book and left it fanned..as if the spells had jumped from the book! This helped fill the space and created interest along the table. We went around Daddy’s library to find objects (not too valuable) to place on the Vampire’s wife table – we even filled a decanter with beetroot juice to make a potion! 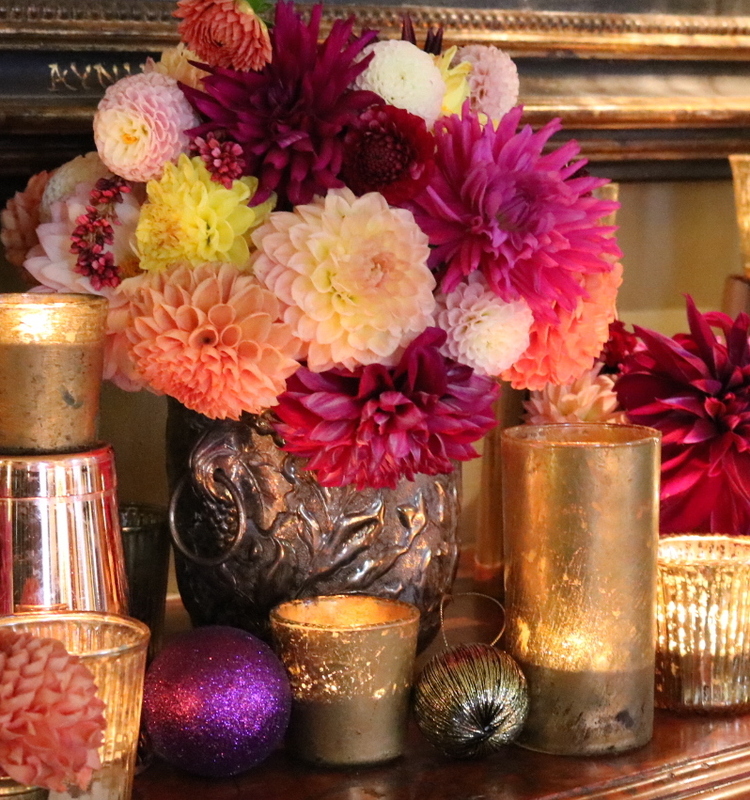 I love using candles – and this look lends itself perfectly to an overload of candles in different vessels – low gold tea light holders – tapered candles and then a taller more interesting candlestick. When constructing the table I tend to make patterns to my work – weaving the different elements together – filling in gaps created. Finally I used leaves, super easy and super cheap every garden has them! 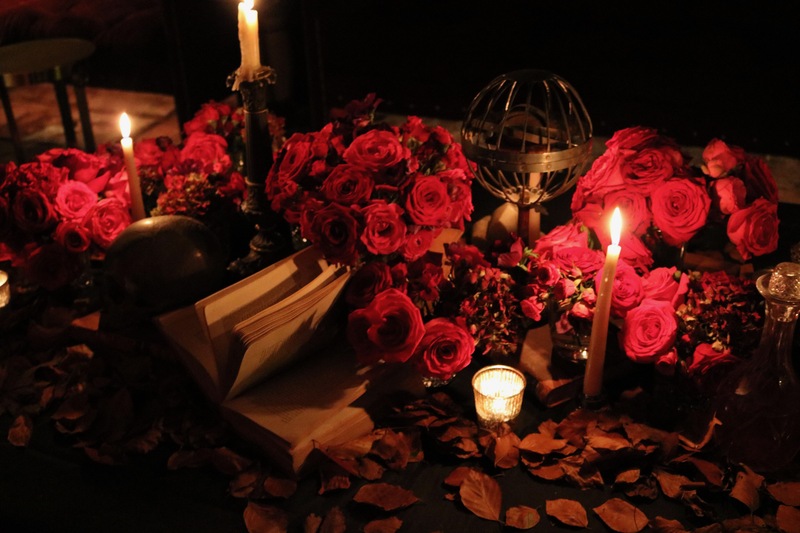 Lyon, Luna and I collected from the garden dried them a little and sprinkled on the table… scatter around the bottom of the books, candles etc… as if they have blown in and this table has been left… spooky!